It's not often I can say that I didn't catch a lick of college football in a weekend, but this past week I didn't. I didn't even know a good deal of what went on until sometime on Sunday. My wife, daughter, and I went camping out at Hanging Rock State Park here in NC, and my high note for this week comes from that trip, though not from the campground. Since we were in that part of the state, we had planned to spend part of a day in Mount Airy, Andy Griffith's hometown, that now spends its days playing Mayberry. We went to check out that scene, but didn't realize we were arriving smack dab in the middle of the Autumn Leaves festival. 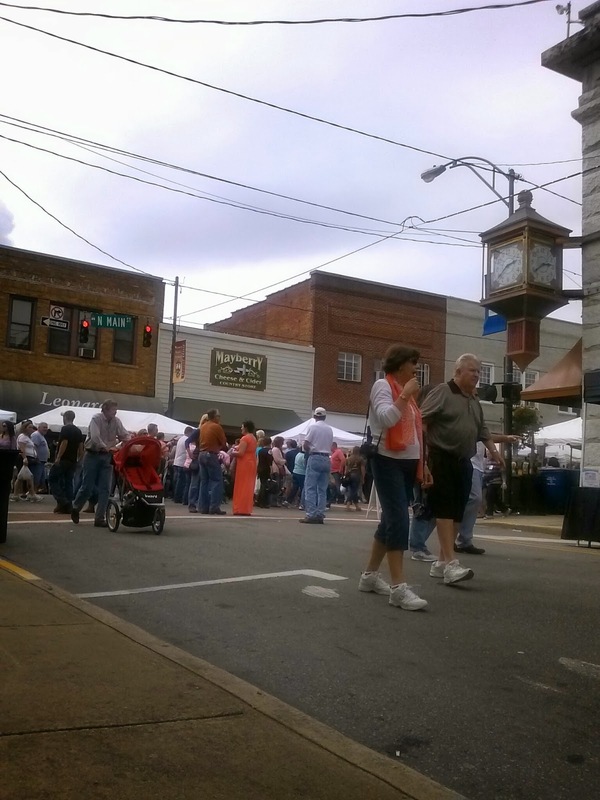 Sooner or later, I will have made it to every autumn festival between here and the Tennessee line, and I'll take it. The cool thing about a small town street festival is that they are somehow all the same and yet all completely different, with their own local flair and charm. And while one might expect the Mayberry theme to be overdone here, that wasn't the case at all, at least not on this day. Someday, I'm sure we'll make our way back for the likes of the Andy Griffith Museum and what-not, but this was just a cool day in a small foothills community.